Click here for the complete version of our article in the National Weather Digest. 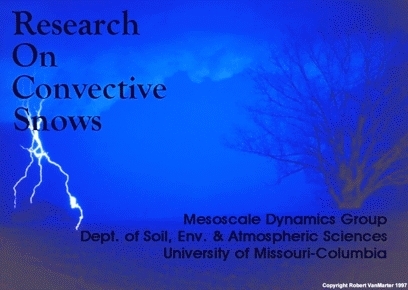 In July 2003, we began a 5-year research program in collaboration with investigators from the National Center for Atmospheric Research (NCAR) and the National Centers for Environmental Prediction's (NCEP) Hydrometeorological Prediction Center (HPC). Funded by the National Science Foundation (NSF), the project will extend the work that we have already completed. The early emphasis of the project will be to develop a forecasting procedure for convective snow events in the central United States. This procedure will guide activities in Years 2-4, when teams will travel into the field with the intent to observe thundersnow events directly using radiosonde balloons with snow crystal replicators attached, a mobile wind profiler, and surface observations including detailed records of the precipitation type and the collection of snow crystal replicas.